According to Droid-Life, two of their readers informed that their Droid Pros received an OTA (over the air) update for Android 2.3.3 (better known as Gingerbread). 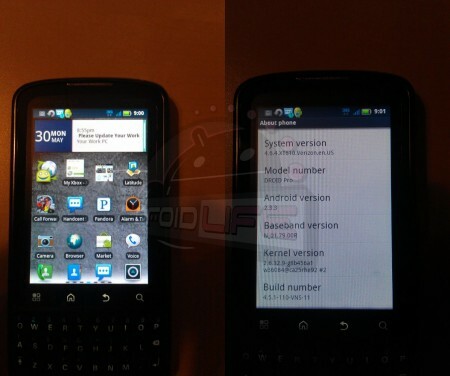 We know that the rollout for the original Droid X Gingerbread update started last Friday, but we never expected for the Droid Pro to be next. We thought that the Droid 2 and its Global brother would be next in line for some 2.3.3 love. In any case, since there have been so few reports on the update, we’re starting to think this update may have been pushed out accidentally. We’ll do some digging and let you know if we find anything. And to be honest, the Gingerbread update for the Droid Pro is virtually the same as Gingerbread for the Droid X and Droid 2. So, do any of our readers have a Droid Pro that has received the Gingerbread update? Leave your comments below or on our Facebook wall!